A plaque commemorates Norfolk Point, a man-made point in Manly Boat Harbour which was gazetted in 2000 in honour of Matthew Flinders and those who followed in his wake. Lieutenant (later Captain) Matthew Flinders was the first explorer to enter Glass House Bay (now Moreton Bay). Having left Sydney on 8 July 1799 in HM Sloop Norfolk he reached Cape Moreton on 14 July. For two weeks he explored the bay and its environs. He named Port Skirmish, Pumice Stone River, and Red Cliffe Point (now South Point, Pumicestone Channel and Woody Point.) Finding that there was a passage (South Passage) from Glass House Bay to the ocean, he named the land to the north of it Moreton Island. Other islands he discovered were Mud, St Helena, Green, King, Peel and Coochie Mudlo Islands. Lieutenant Matthew Flinders RN, in the colonial sloop Norfolk, explored and mapped Moreton Bay in July 1799. A replica of the Norfolk commissioned and skippered by Bern Cuthbertson AO, visited Manly Harbour in July 1999 as part of the Matthew Flinders Bicentenary Celebration (Queensland) Celebrations. 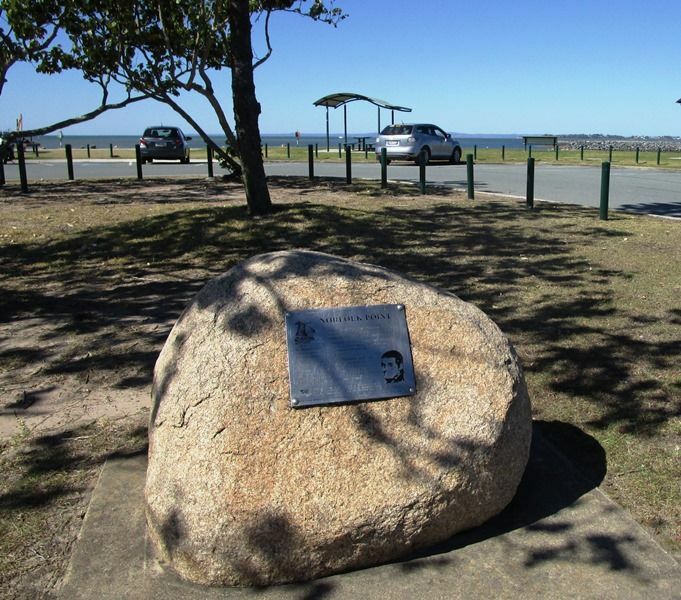 In honour of Matthew Flinders and those who followed in his wake, the man made point at the eastern end of the northern wave-break of Manly Boat Harbour was officially gazetted as Norfolk Point on 3 March 2000 under the Place Names Act 1994. This memorial plaque was erected 22 July 2000 as a joint project of the Port of Brisbane Corporation and the Wynnum Manly Historical Society Inc.